The Mad Ranter: Gilgal shenanigans, and skate-park design. Gilgal shenanigans, and skate-park design. Badly in need of a hyphen. Uncharitable thought, and some other bits. Yellow jackets at standing at the Vale Road exit into Gilgal this morning. Red marks on the pavement suggest they're continuing their footpath march around this corner. If they continue as they've done before then this road may be closed off. At first this might not seem so bad, after all there's another entrance into Gilgal from Minster Road. That's fine it's getting to it that's the problem. 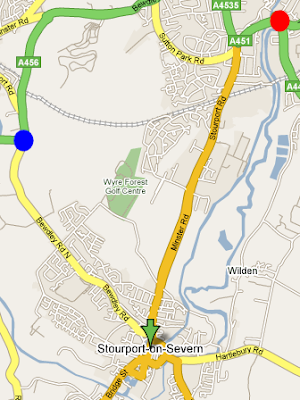 As mentioned before Stourport has a figure-eight road system, what hasn't been mentioned is that, unless you're intimate with the road network, once you're off that figure-eight you can't get back on it again. 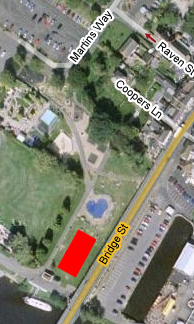 I'll take the worst-case scenario that they don't inform drivers that the road is closed until they're on Vale Road (arrow). Where do they go? Onto the traffic lights you can turn right to the church, but then it's a U-turn in the road - I think not. Going straight on and following your nose the next island is in Kidderminster (red); turning left and doing the same and you're just outside Bewdley (blue) before you reach an island. If they're intelligent they'll warn people as they come to the end of High Street, turn them down Lickhill Road, right at the lights down Bewdley Road and then right into Gilgal. Locals will of course turn down Vernon Road or Park Avenue and cut off that entire long corner, not good for the residents though. I'm sure it's all been thought out and planned for in advance and that all the gesticulation being done by the yellow jackets was simply information dissemination. Hmm. Things are hotting up with the skate-park, the WFA has alerted me to Councillor Campion posting what is presumably the initial design. The geek in me shows with my first thoughts being "I wondered what they rendered that with" Something about the light says Rhino to me over AutoCAD , not that it matters. The viewing angle cuts off sight of the paddling pool and the riverboat building. The main arch under the bridge isn't delineated clearly nor the path that goes through it. Some dimensions can be made out, but no overall size is shown; so how much of the area it'll cover is only guessable by the arch work. Though that's suspect take a look here, the arches are different heights. So it appears to be called Martins Way Skate Park, as I've mentioned on a WFA comment shouldn't it be Car-Park opposite Shipley's Skate Park? Skate-park in red, Martins Way at the top, car-park on the other side of the bridge with an path continuing under the arch. You're an emergency vehicle, how would you get to the skate-park? Down Martins Way, through the barrier to the lower car-park, then along the path between Playland and the playground; or down to the car-park before heading on foot through the arch? Almost sounds like I'm advocating the site next to the pool, I'm not. Into the lower car-park and down the path next to Playland and you're at the site I've suggested. As for the builders Tav's asking questions on some skater sites so it's a wait and see. There have been some comments that some of their work looks like pre-fab stuff and that perhaps it's a spin-off side-line from the companies main playground business. Not good so far. Oh very late, but this alternative pay and display car-park sign has gone. So presumably it was only for the Christmas period when Raven Street car-park was being used?